A heavy emphasis should be placed on the *attempt* portion of my post title. While it looks passable, this pizza left a lot to be desired. The good news there are many easy fixes that can be incorporated into the iteration. 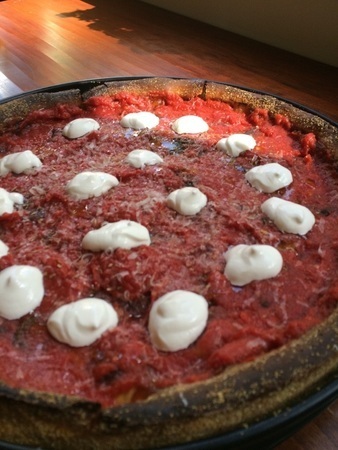 A question for the deep dish experts out there: During the bake, the sides separate from the wall of the pan. This caused the bottom portion of the edges to be undercooked. How do I correct this? Is it a matter of pushing the dough into the side of the pans? 1. The pan used wasn't heavy enough. This would have definitely helped. The pan in the picture is a 20 gauge cake pan. It should be 14 gauge to have the proper thickness. 2. I followed the deep dish dough recipe in the Pizza Bible and used Ceresota flour. I was pleased with the dough, even though end result wasn't amazing. 3. This dough ball went through a 24 rise. Tonight I will try the second dough ball. I'm not an expert, and it sounds to me like your diagnosis is on. For what it's worth, I use a heavy gauge black steel pan, and it holds and conducts the heat really well; I make sure there's no airspace between the crust and the pan; I rotate the pan about 13 minutes into the bake (and do the bake on my lower steel); and I add the sauce after the bake. I can't tell from the photo whether you used a rolling pin to cut the dough at the top, which is what I do. Good luck with tonight's bake!